This actual race was made famous by the print maker Courier & Ives. The heavily stylized print showed the two steamers, racing along close to each other in the moonlight. In actuality, the only time they were within sight of each other was at the start. John Cannon, owner of the ROB’T. E. LEE, arranged for coal and wood barges to be brought out and unloaded while LEE was under way. He carried few passengers and no freight. Thomas (T. P.) Leathers did none of the sort. He carried passengers and freight and made a number of stops along the way. The actual time a NATCHEZ trip was underway was less than LEE’S. Cannon, of the LEE, died broke. Captain T. P. Leathers, of the NATCHEZ, died a millionaire. Cannon forgot the steamboats were businesses, not race horses. The race got underway from the foot of Canal Street at 5 p.m.At the beginning of the race, LEE backed out around the NATCHEZ stern, thus trapping her for almost five minutes. Although crowds lined the waterfront, no photos of the start of the race have survived and only one was taken of LEE, but it was from far away – just below St. Louis. 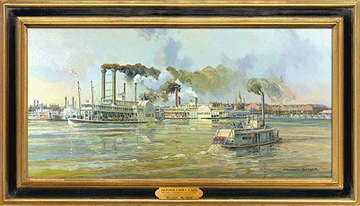 The St. Louis Cathedral and Pontabla Apartments show in the painting, along with oyster skiffs, which are tied in front of Jackson Square. I have great respect for the literary giant Joseph Conrad. 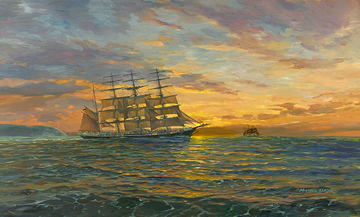 His reoccurring themes of redemption and courage against overwhelming odds, have made his stories of the sea live on through the ages. My painting was based on Conrad's short novel - “Shadow Line”.